From its first issue in April, 1970, the National Lampoon blazed like a comet, defining comedy as we know it today. 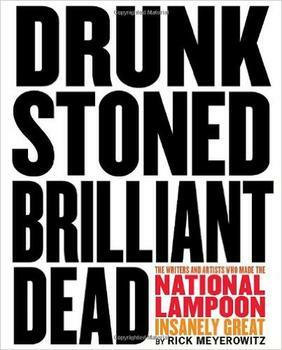 To create Drunk Stoned Brilliant Dead, former Lampoon illustrator Rick Meyerowitz selected the funniest material from the magazine and sought out the survivors of its first electrifying decade to gather their most revealing and outrageous stories. The result is a mind-boggling tour through the early days of an institution whose alumni left their fingerprints all over popular culture: Animal House, Caddyshack, Saturday Night Live, Ghostbusters, SCTV, Spinal Tap, In Living Color, Ren & Stimpy, The Simpsons—even Sesame Street counts a few Lampooners among its ranks. Long before there was The Onion and Comedy Central news shows, there was the National Lampoon, setting the bar in comedy impossibly high!